As I post this blog, I’m thinking that one should never think that they’re too old, or that it’s too late to do what you love. Don’t quit. Too late is often just the right time. Down by the garden our 150-year-old apple tree was loaded with blooms a few weeks ago and now it is covered with leaves and tiny apples galore. 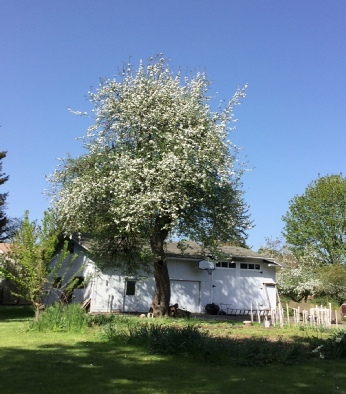 This dear determined fruit tree is the lone survivor of an orchard that once belonged to the founder of our town. His house, built in 1854, still stands, too, a few yards from my writing room window. The house was his family’s home to start with, after that it became a hotel, then a city hall–and for many years was our town library. In the future it will continue to survive as a museum. It’s for fair certain that I’ll not live to be as old as the apple tree, nor asold as Conser House. My 8th decade is mid-way, my hair is silver and my bones occasionally ache, but I am still blooming. 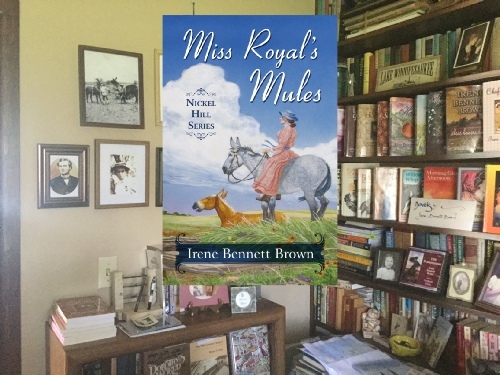 My 20th book, my new novel, MISS ROYAL’S MULES, will be released this fall, and a sequel is written. Hey, I’m just getting started…! I’d never met another professional writer anywhere but at an ‘Author Event’ so maybe you’ll understand my lack of judgment on a day last January. We (me, my husband, and a daughter-in-law) were heading home from an outstanding art show held by our daughter, Shana, art teacher, and her Middle School art students. We considered stopping at our grandson’s primitive-bow making class, too. (We’re a creative bunch). I wasn’t sure we should interrupt Carson’s class, but curiosity about bow-making (archery) won. Right away Carson said that I should meet an author taking the bow-making class. This guy, John Larison, looked so young approaching me. My fool mind thought, “a wanna be” likely. John had a book coming out in August. Trying not to feel too superior, I asked who was publishing this book, Whiskey When We’re Dry? John answered, Viking. I almost dropped to the floor. Yes, one of New York’s topmost publishers. Minutes before our arrival, John had received word that his book was optioned for a movie. Thank heaven he couldn’t read my mind, earlier! We had such a great time, talking about why we set our books in the 1800s, wrote about the West, and our favorite books. We’d both loved News of the World. High on his list was True Grit, which shares similarities with Whiskey When We’re Dry. Do check it out on line for lots more information. My grandson snapped this photo of John and me. 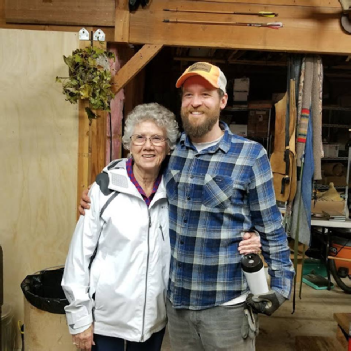 John was taking the class for research and to learn to make a bow for himself, and for his daughters, but had to leave without finishing–movie stuff awaiting his attention. I pre-ordered the book that same day. A seven-month wait, it was released this week. Viking sent John “a blazing new voice in fiction” on a pre-publication tour, and out again after publication. Whiskey When We’re Dry has been named Best Book by Entertainment Weekly, O Magazine, Goodreads, Southern Living, Parade – and more. Both film and TV rights have sold. I just finished reading my copy. This tale of a girl who passes as a man to find her outlaw brother and bring him home is gritty, insightful, moving, and unforgettable. I’m still in awe of John’s writing.